The Hallite 512 is a standard profile loaded U-cup with precision trimmed sealing lips manufactured in either a polyurethane or polyester shell energised by a high quality O-ring and designed for common North American grooves. The precision trimmed sealing lips ensure optimum sealing action. The deep profile of the Hallite 512 provides extra stability needed to resist rolling in the groove. Together these features result in improved life and sealing. At zero or low pressure, the O-ring helps to increase the sealing force preventing any bypass. Under most conditions as the pressure rises, the sealing force increases and the O-ring ensures complete lip actuation. The symmetry of the Hallite 512 makes it ideally suited for single-acting rod and piston applications and its flexibility enables easy installation. 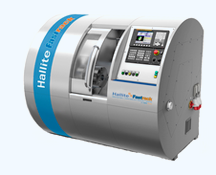 The Hallite 512 can also be fitted back-to-back for use in double-acting applications. Although the Hallite 512 can be used as a rod seal, other Hallite profiles are more suitable options, such as the Hallite 513, 605, or 621.